Soft-spoken and modest, Chan doesn't know it but she was a key figure on my foray into sweet soups during my younger days. She's a friend whom you can share every imperfect bit about yourself; that friend who accepts you as you are. I was reminded of her when I made this. We lost touch when I moved to the city. 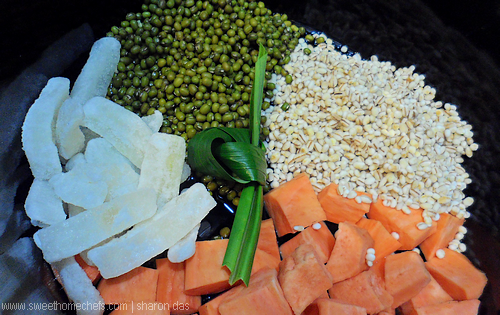 It started with my first attempt at making mung bean soup. I told Chan about my upcoming kitchen adventure. Her enthusiasm soared and she started sharing with me various sweet soups she had tried before, from wheat porridge to red bean. I called her a couple of times about the ingredients I would need and the hows. 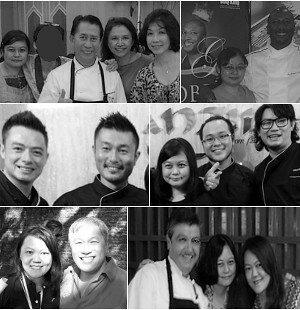 Once I got the basics down to a pat, I began working with various ingredients and flavours to suit my moods and palate. After that, I was well on my way. Many different sweet soups have been made since! 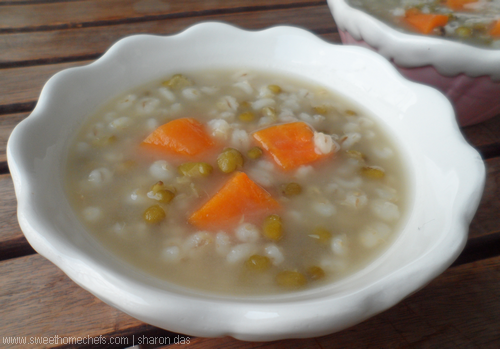 This mung bean soup is sweetened with candied winter melon. Brown sugar, jaggery, honey rock sugar or just plain sugar is a great alternative. That's the magic of homecooking. It's about being free and easy, tossing this and that into the pot with a happy song in the heart. This sweet soup is an effortless dessert that I love making because it's basically about gathering the ingredients and leaving it to cook for a long time. 1) Place all the ingredients into a slow-cooker. Add the water. Stir the ingredients. 2) Cook on high until the beans are tender. It took 3 hours for me. Add more water if a soupier version is preferred. Optional: Serve with a splash of coconut milk. 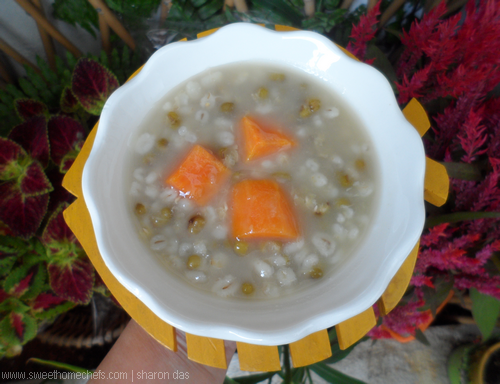 4 main ingredients: Candied winter melon, mung bean, barley, sweet potatoes! It's good as a chilled dessert too. For this, I would usually add more water as the soup turns out thicker when chilled and I would add more candied winter melon too, not just to match the additional water, but because I find the sweetness a little flat. It has been a while I did not cook mung bean. Hubby loves it and so am I. But couldnt take much as it can cause stomach indigestion. Anyway yours look so good, luscious and full of goodness. Chan is just as sweet as her sweetened soups, isn't she? Love mung bean soup and the combo with barley sounds really great. One of my fav and this is just so good. Haven't tried this before but I'm sure it'll help to cool down our body temperature! I sure hope so. The weather's been really hot! I would love a bowl of this warm sweet soup...this is the kind of dessert that my mom use to make when we were little. Looks delicious and nourishing. Love how it also made you think of your lovely friend. Yeah, I sure miss her! I've always cooked mung bean soup and barley soup separately, never tried combining them together before, sounds delicious! Somehow we always end up with dal as far as mung beans are concerned.This is such a lovely variation.